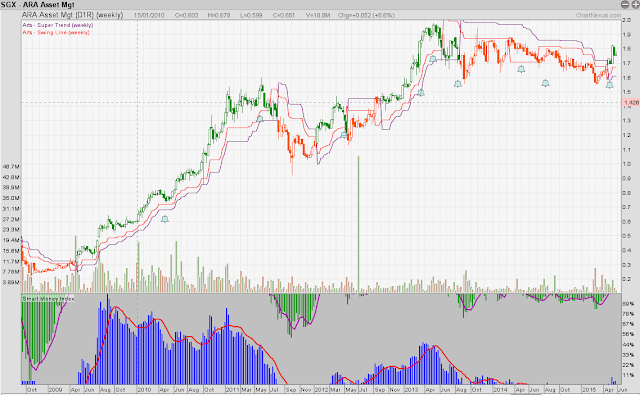 Li Ka-Shing backed ARA Asset management Moving higher? Since 2009 ARA have been going on an uptrend, looking at the weekly chart, 2014 was not a good year for the company as the price when a bit lower. For the past few weeks we see ARA started moving again, in the chart above the price is telling us the mid-long term uptrend is here, indicated by green candle on our system. by the way, this week we are not having Seminar, for upcoming Free stock seminar dates, time and Location please Drop me a message.